Striker Jozy Altidore is the only member of Team USA set to miss the clash against Germany at World Cup 2014 on Thursday, June 26. 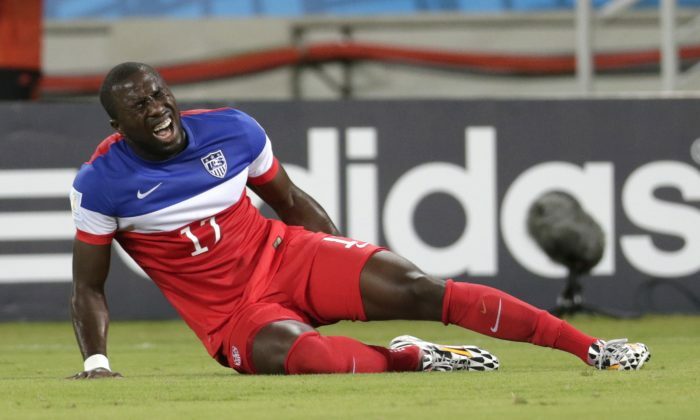 The Sunderland player strained his left hamstring during USA’s opening game against Ghana on June 16. The United States beat Ghana 2-1 in that match, and drew Portugal 2-2 on Sunday. Altidore did not feature against Portugal. If USA win or tie Germany on Thursday, they will move on the the second stage of World Cup 2014, and Altidore will get his playing chance again. Another USA player, defender Matt Besler, appeared to pull his right hamstring as he stretched to clear a ball in the Portugal game, but is apparently fine to face Germany. See an Associated Press article on Team USA’s World Cup recovery. RECIFE, Brazil (AP) — If there’s such thing as a Manaus hangover, U.S. players insist they will be no part of it. One less day to recover than Germany? No big deal. The Americans are going into the biggest match most have ever played looking to break one streak and start another. England, Italy, Cameroon and Croatia all lost their next game after playing in the heat and humidity of the Amazon rainforest capital of Manaus. The Americans, who allowed a 95th-minute goal in a 2-2 draw with Portugal on Sunday, may not be able to afford a loss when they play three-time champion Germany in their Group G finale Thursday with a berth in the knockout round on the line. If they can advance, it would be the first time the U.S. has reached the next phase in consecutive World Cups. Moments after the disappointing finish against Cristiano Ronaldo and Portugal, coach Jurgen Klinsmann pointed out how Germany had an extra day to prepare. Klinsmann’s native country, which he led to the 1990 World Cup championship as a player and coached to the 2006 semifinals on home soil, played to a 2-2 draw with Ghana in Fortaleza on Saturday. And there’s pressure on the second-ranked Germans. They’re a favorite to win the tournament and are trying to become the first European team to win a World Cup played in the Americas. Whether Germany’s legs are fresher Thursday at Arena Pernambuco with one extra recovery day is to be determined. Rain very well could be a factor, too. Regardless of any perceived disadvantage, the Americans understand they put themselves in this situation by not securing those three points that were oh so close against Portugal.